The picture of a whole lamb slowly turning on the spit over charcoal and the smell that accompanies it spells Easter Sunday for Greek people across the world. Yet, this is not a simple culinary tradition. On the contrary, there is rich religious symbolism for the particular meat. John, the author of one of the four Gospels, called Jesus the Lamb of God in John 1:29 and John 1:36. In the story, Abraham had to sacrifice an animal, such as a lamb or a ram, as an important part of the Jewish religion. People offered God restitution for the sins they committed. However, Christians no longer need to engage in sacrifice because Christ died on the cross for their sins, thus becoming the sacrificial lamb. Since Pascha, or Easter, is the day where we commemorate Jesus’ sacrifice, we eat lamb in remembrance of this selfless act. The symbolism of the lamb goes back to the Old Testament. When God asked Abraham to sacrifice his son, Abraham obeyed God and started to prepare for the sacrifice. When Isaac saw what his father was doing he asked, “The fire and wood are here, but where is the lamb for the burnt offering?” Though Abraham didn’t really want to kill his son, he was willing to do what God wanted him to do. When God saw that he was willing to obey, He told Abraham to stop. Abraham sacrificed a nearby lamb, instead. 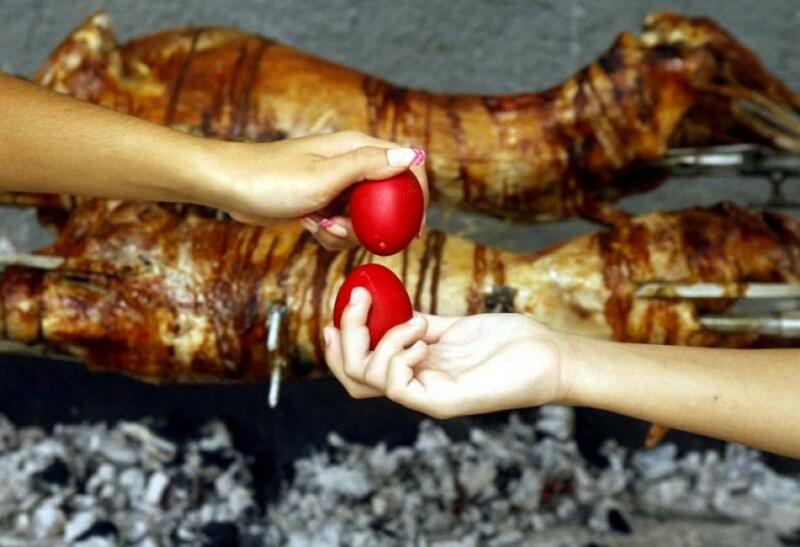 Today, Greeks spend Easter Sunday morning slow-roasting the lamb and then the whole family gathers on the table to eat. The whole preparation and turning the spit is a communal experience that bonds people in the holy day.